Anybody else's mobile browser look like this? Up until recently, the notification marker had been just to the right of the word. No, I just checked and my notification marker is still to the right of my username, Dragonpol. This is on my mobile browser. Just a thought but perhaps the length of your username has something to do with it. A bit odd though as presumably it all fitted in OK before, unless the site has had some kind of upgrade? @Dragonpol, and the triviality. Besides in the Bond 25 Production Thread, that is. It's those who fill it with off-topic chatter day by day that has made it earn its reputation. It's no one's fault, but the lack of B25 news proves frustrating given that it's been a year since Spectre's rollout to cinemas. From its creation that thread has had maybe 10-20 pages of actual Bond 25 relation content and discussion of news, everything else is just random whining about things people don't understand or know enough about to speak of. 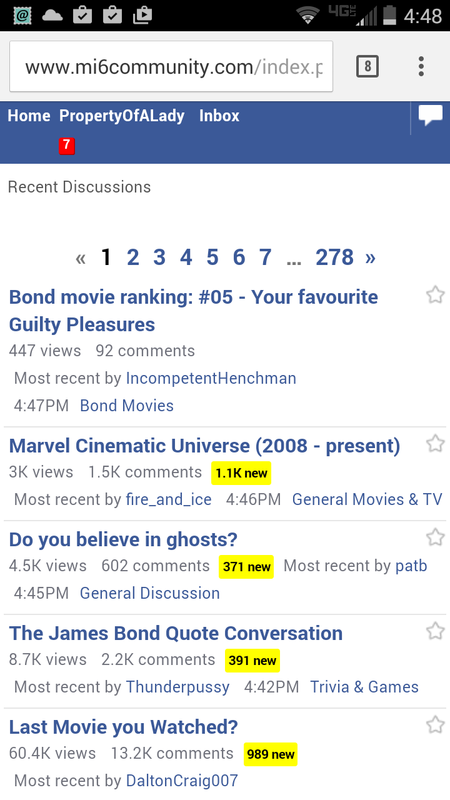 In less than a day 70 plus new posts are in there from the last time I checked it. What is left to talk about at this stage, post-the New Yorker interview? It's why I've decided to just stop paying any notice to it, because the ignorance inside it makes my brain want to hemorrhage. Hopefully I was able to dial down the issue to some degree. What's really a shame is that the thread does contain some very insightful posts and debates, most of which is buried with nonsense. You did great, @jake24. Let's just hope your orders stick. Is it possible to update the "favorite Bond film" section to include SPECTRE? I may be a bit thick here Jake, but I'm not sure which section you mean. Can I ask everyone, if you do flag a post can you make sure you add a reason for the flag. Believe it or not, it isn't always obvious. Put as much or as little as you want, but it does help us when dealing with the issue. 9/10 a reason is added but occasionally we don't get the information and it can become guess work. Amendment: SPAM BOTS are not included in this of course. I often don t bother giving a reason when it s the usual spambots, as that seems like an obvious case. So I just registered a few days ago and I read somewhere it's "illegal" to post stills from the James Bond films. If EON you won't allow a standard screenshot, then do you also not accept a modified picture from a film? It sounds worse I know. However, if you use regular filters and effects to make it look like a negative/drawing, then technically it's not an official screenshot any longer but it would be recognizable for us to talk about... just an idea. Stop to think about it for a moment if you will @Bond Aficionado it has been explained in the other thread that EON have requested that we do not post any images which are copyright ,and in order to maintain cordial relations with them we comply with this request . A copyright image altered is still a copyright image It's that simple . I miss the News Snippets thread. I often see random items in the news that in some way relate to Bond and now have nowhere obvious to post them. The old thread was merged into a Spectre news thread which didn't make any sense because there still needs to be a place for other film related random news items. That or the Bond 25 Production thread. @Thunderfinger How was your Tea and Toast ?. Thanks, I guess realistically drawing a screenshot is also illegal then. No. That would be owned by the artist. Selling it however could cause trouble, as a copyrighted character is still featured. Of course, you can just include a link to any copyright material. Saves having to draw images I would think. Tea was fine. Out of toast. Sorry, old chap, bread is still rationed here. MI6 should be on top of this. Well when you're one of the worlds most popular and used James Bond sites, then you attract many people to your site. However, you'll find they rarely disrupt the goings on of the forum, and are quickly dispatched. EDIT - If you see a bot or troll post, then please flag it, for a mod to dispose of. Always much appreciated. The mods do a magnificent job considering how many of them are 'active' versus the rubbish ,bots and idiot members that always arrive. Yes, the mods here are brilliant. There's spam on the pages at times, yes, but the mod team are not full of pre-cogs and thus they can't readily predict when spam posts will go up. They rely on us to flag the rubbish and alert them to its presence so that it can be dealt with in a timely manner. It must not be forgotten that they have actual lives away from the forums as well, and can't be here at all hours of the day. Accept for @DarthDimi, at least. I believe they strap him with chain to a chair and sit him in front of a computer screen, with two pee breaks a day. That's the rumor, anyway. Quick Q: why does the site mark "English" spelling (favourite) as incorrect? Ironic, no? Are there more US members on this website perhaps? I believe this has to do with the language you selected to write with on your operating system (Windows or Linux?). If you selected English (United States), it'll label it as a wrongful spelling. But, with English (United Kingdom), it'll accept it with no complaints. What's the preferred spelling here? I don't think there's a preferred spelling system here. At least not that I know of. Have you tried other sites like Facebook or Twitter?